They may not have a private gardener, but you can make them feel like they do. 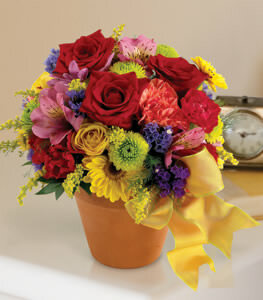 Our rustic terra-cotta pot arrives filled with a mix of seasonal blooms. A mix of blossoms - carnations, daisies, spray mums and alstroemeria. Thank you so much for getting these flowers in such short notice. They were well received by the family and I really appreciate your service!